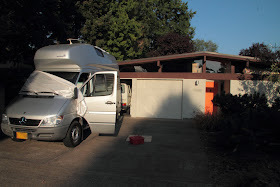 During the last trip home from the Columbia River Gorge Brunnhilde's driver side door power window failed. I was not going to pay the exhaubitant price of $250 of the entire window regulator assembly because Mecedes' cheesy design of the flimsy plastic slider. Automakers should know very well the stress imparted on the power window components after decades of building vehicles with power windows. It is unbelievable that Mecedes' engineer managed to screw this up, and yet have the audacity to gouge the customer with a $250 replacement assembly. yep - this flimsy plastic slider fail leads to a $250 replacement regulator! Most Sprinter owner who encounter the same failure opts for a home made solution which involves fashion a replacement plastic slider out of plastic closet wheel. I consider doing same but decided against it due to concern of it's reliability in extreme low ambient temperature. Instead I tried to think out the box for a solution. I was going to make a replacement slider out of DuPont Delrin which would be much stronger and better due to the inherant self-lubricate property of this very strong engineered material. However I would still have to replace the rivet that the plastic slider attached to with a bolt. I rethink another approach to a reliable repair. While conducting self-help research I examined the parts manual I thought to myself if the window regulator would be cheaper. Clearly the manual window system share most parts (see diagram below) with the power window so it should have the same plastic slider. As often with less than accurate dipiction the diagram use the same dipiction for two different regulators - which obviously not to be taken at face value the power version should have a DC motor on the depiction. Judging from the DC motor being listed as a separate item, I infer the regulator for the powered window does not comes with one. Why MB changes an outrageous $250 for the powered version - more than 5x the manual one. May be to take advantage of the extra gravy from this failure-prone part. If both share everything including the sliding channels on the bottom of the window which the actuation arm raises and lowers the window it is likely the arms' interface to the window channel is a common part. Examining my fail powered version I see no reason the arm on the manual regulartor would be any different. I suspected it is the same part that rivetted to a different gear plate (likely to have different gear ratio). Internet is wonderful. I was able to look up the price of the manual regulator. It is $42.60 list price instead of ~$250 for the powered version. While the web vendor price is about $10 cheaper, by the time you add shipping it is back to the dealer's full list price. I opted to ordered from my local dealer. 4 days later the part arrived. I went to the dealer and pick it up. Everything is as I expected. 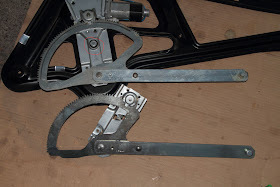 The actuation arm looks identical to my failed one and is rivetted to the gear plate with 2 big rivets. There is no reason I cannot transpant the good arm to my failed regulator assembly with some elbow grease and tanacity. Wait, where is the plastic slider? I rummaged through the packaging and there is no plastic slider to be found. I just wasted $42.60 (which is the risk I set out to take)! I gether myself, and looked closer at the mushroom rivet at the end of the actuation arm. It looks bigger than the one on my failed unit based on my recollection. Unfortunately I don't have the old unit with me. I went home with it hoping I was right. Arriving home, I wasted no time to examine them side by side, and my hunch proved right. Both regulators share the same common actuation arm. While it is not designed to be a serviceable part one with some skill can overcome this barrier. It was a very hot day in town so I waited for late afternoon to start working on it. Unfortunately as autumn approaches the sun is much lower to the south and even as it sets the driveway is not shaded by the giant redwood across the street as it is during most of summer. As I suspected, the manual regulator gear ratio is different but my hunch is correct. They both share the same actuation arm. Note that in the picture below, the old regulator has a a big rivet (circled in red) covered with a plastic sleeve not found on the manual version. It serve as a stop when the window is fully raised or lower so the power window does not prematurely destroy itself by the high torque of the motor. So far so good. Now I have to decide how best to warp the new arm to the old regulator. The obvious is to drill or grind out the two rivets that secures it to the gear plate and replace the rivets with screws/bolts and nuts. It is not the best of idea because the bigger rivet serves as the pivot for the gear plate. Replacing it with a screw or bolt would be a heck to my liking. I thought hard for a best approach without risking messing it up. I decided it is best to grind out the rivet on the new arm to see what it look like. Sure enough the big rivet has a smooth shaft allowing the gear plate and the end of the arm to rotate. It is a very hefty rivet. Seeing this I want to preserve the big rivet of the old arm. I removed the arm from the new manual regulator intact so I can deliberate the best way to transplant it. While I was racing against the setting sun I hear this unusual aircraft sound. Immediately from the sound I knew it came from vintage propeller aircraft. I look up into the sky overhead and see this squadron of vintage WWII aircraft flying overhead. I raced to the garage to crab the camera. There is no time to change the manual settings so I just snapped 2 shots before they disappear out of sight. A neighbor happens to be restoring a WWII fighter trainer. I cannot remember the exact model and believe it is a P39 (single radial engine). The sun is setting fast and I knew I would not have enough time to finish the job. I improvise a way to keep the window securely up for the night with a piece of wood wedge. I contemplated the best way to swap the arms without compromising on the big rivet that serves as the pivot of the gear plate. I would have to cut the arm and reattached at the cut line. The best place to cut the arm is at the hole. Today is a nice overcast day. Just a perfect day for a shade tree mechanic. I started early in the morning to resume the repair. After I put everything back together I realized I have two medium size star screws left. For the life of me I could not remember where they go. I have to resort to the photo I took along the way. what are the 2 extra star screws for? Having gone through this repair process knowing what Mercedes has change the design in replacing the flimsy plastic slider with a bigger metal mushroom rivet, I now know the repair can be achieved by a much cheaper method. Essentially one just have to grind out the small rivet at the end of the actuation arm, and replace it with a bigger mushroom rivet. This mushroom rivet can very easily fabricated out of a bolt and two nuts. By grinding the head of the bolt to form a mushroom head it servers as the slider in the window's actuation channel. The two nuts are then used to secure the bolt to the actuation arm's rivet hole. If you have a wire welder like me, you would not need the two nuts as you can just weld the bolt to the actuation arm directly. Alternately for the mechanically inclined, instead of using a bolt and two nuts you can try to find a right rivet from McMaster Carr to achieve similar result.